Do you ever dream of being a Anisong singer? Winner of Asia Anisong-Singer Audition (AAA) to debut as an Anisong-singer under a Japanese major record label. 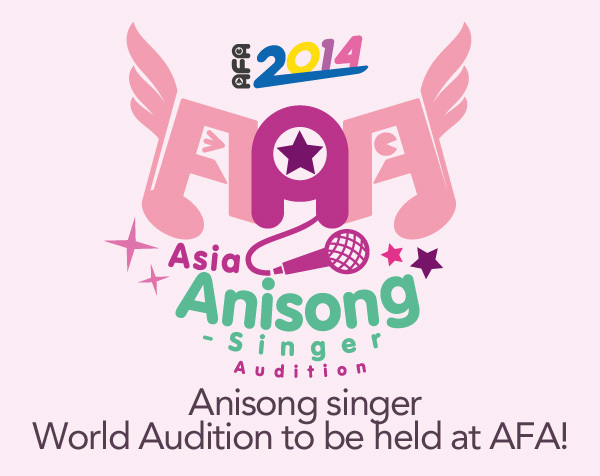 The Asia Anisong-Singer Audition (AAA) Committee will conduct auditions at South East Asia’s largest Japanese popular culture event, Anime Festival Asia 2014 (AFA2014), to discover the next breakout Anisong-singer. The Asia Anisong-Singer Audition (AAA) will conduct a preliminary round of screening, following which two rounds of auditions will be held in Singapore. The grand prize winner will be decided through the final audition at AFA2014’s main stage on 7th December 2014. The winner will secure a performing contract with a Japanese record label as one of their anisong-singers, and will perform globally, while primarily being based in Japan and Singapore. Aspiring talented singers who love Japan, anime and anisong, and wish to hone and showcase their talents on an international level can send their applications in from today till 14 November 2014 (2359 hrs). For more details or apply for AAA, members of the public can check out http://animefestival.asia/afa2014/aaa . AFA2014 will be held from 5 to 7 December 2014, at Suntec Singapore Convention and Exhibition Centre Level 4. Established in August 2014, Gynoid Co., Ltd. is a 100% owned subsidiary of Yoshimoto Kogyo Co., Ltd.
developing several business opportunities centred on the internet. No restrictions on age, nationality or gender. Not currently under any exclusive contract with record labels, production company or music publisher. If selected as winner, he/she must be able to be based in Japan and Singapore. If selected as winner, he/she must be able to be affiliated under the designated production company by the organisers. Audition music video data (link) Upload a video of yourself performing your chosen audition song to a video site (E.g. YouTube) and provide the URL link in the application form. Video length should be slightly more than one chorus of the song. If applying as a group, please submit a photo that shows all members. • Incomplete submissions will result in the rejection of the application. Please check through before submitting. without parental/ guardian approval will not be accepted. Application information or data will not be returned. Enquiries regarding screening process and results will not be answered upon submission of application. Application information submitted will only be used for selection. The date and time for the second screening and finals of the audition may be different from the listed date. • Replies sent by organisers in response to queries from potential parties are meant only for the designated party. Without the prior approval of the organisers, you are not allowed to forward any or full contents of the email for secondary use. To prevent the intrusion of computer viruses, there will be circumstances in which file attachments will not be opened and deleted accordingly. • Personal information provided will only be used in support for any queries, selection process as well as to contact shortlisted candidates. It will not be used for any other purposes. • All necessary actions will be taken to safeguard the loss, leakage or fraudulent access of personal information. • Responsibility in the destruction of personal data in a manner in which it cannot be recovered, will be undertaken by the organisers upon completion of its use. I belive what you said made a lot off sense. excited about what you’ve written. In my opinion, it might bring your posts a little bit more interesting.